The Tiger (Panthera tigris) is solitary animal. 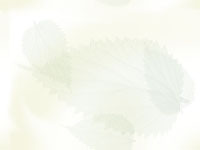 Their main foods include sambar and chital deer in India . The tiger population is in decline, so many natural reserves have been set up to protect its habitats. 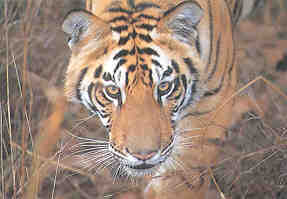 Tigers in the Indonesian area, and Sumatra live in jungles. Siberian tigers are found in Russia and live in a more woodland like terrain. Bengal tigers live in habitat that is grassy but also has its thick vegetation. The tiger in being has so widely distributed has evolved into many subspecies. The Leopard (Panthera pardus) is a cat found not only in Asia but throughout Africa as well. The one pictured here is a rare Chinese subspecies. Leopards are solitary tree climbing cats. To keep their kills from other animals they drag them into the trees. Leopards as a species are very wide spread, in fact they have one of the widest distributions of all the cat family. Having a wide distribution forces a animal to be versatile. 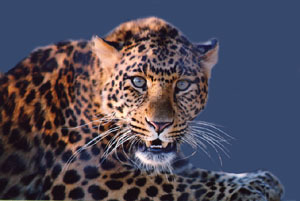 Leopards in Asia are found competing with tigers and African individuals with cheetahs and African lions. 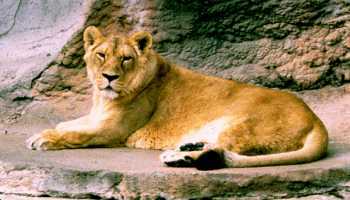 The Lion (Panthera leo) is mainly a African cat but one subspecies is found in Asia. The lion at the right is a representative of this subspecies. This rare subspecies, native to India is as social as its African relatives, living in family groups know as prides. They typically contain less males than females. The lions in Asia are confined to a small area called the Gir forest. People are also inhabitants of this space. Lion human encounters are quite frequent in this confining nature reserve. And conflict is inevitable.